OT for Kids provide a range of equipment to aid with many aspects of child development. One of which being sloped writing boards to aid in improving handwriting for children. These sloped writing boards are hand-made and tailored for the needs of your child. What is a Sloped Writing Board? 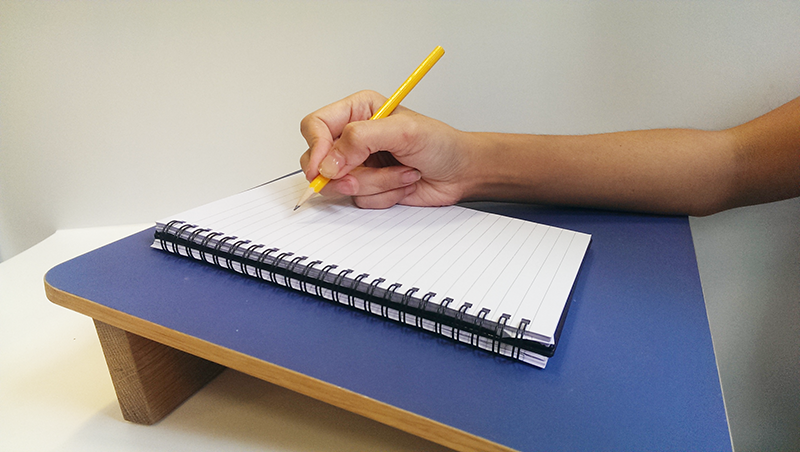 A sloped writing board is used to elevate the position of the paper when writing. Through elevating the paper off the table, children are encouraged to write whilst seated in the optimum position for writing. This includes having their feet on the floor, head up and back straight. It is very common for children with handwriting difficulties to lean forward with their heads close to the table when writing. Through using a writing board, children are less likely to do this due to the elevated position of the paper. What are the benefits of using a Sloped Writing Board? How much is a Sloped Writing Board from OT for Kids? OT for Kids provide hand-made sloped writing boards at a cost of £45 per board. We offer discounts for large orders, particularly to schools or learning support.